When the Ultimate Warrior made his shocking return to the squared circle on WCW Monday Nitro in Fall 1998 — and I use "shocking" here loosely, since "shocking" returns became, over the years, as much a part of the Warrior's shtick as the facepaint and tassels — Hulk Hogan's response was, "I … I thought you were dead." He wasn't the only one. The question going through the mind of the curious wrestling fan was more pointed: Was that even the original Ultimate Warrior at all? Since his first "shocking" return in 1992 at WrestleMania VIII, when he rescued Hulk Hogan from a beatdown at the hands of Sid Justice and Papa Shango, the pro wrestling world had been abuzz with an unlikely urban legend: that the Ultimate Warrior had disappeared from the WWF in August 1991 because he had died, and upon his return the character was being portrayed by a new wrestler. The evidence was circumstantial but somewhat compelling. This new Ultimate Warrior had a shorter haircut, blonder hair, and a fleshier, less-defined physique. (Sometimes, he even wore a singlet, flesh-toned and airbrushed with veins and striations to approximate the old Warrior's musculature.) And under that mop of hair and behind his unmistakable, all-obscuring face paint, it seemed that half of the bodybuilders on Muscle Beach could have done a convincing impersonation. The Ultimate Warrior's frantic style and garbled speech, though unique in that era of wrestling, wouldn't have been too difficult to imitate. Just imagine: The Warrior's signature music plays; some imposter of a muscleman scuttles to the ring; the crowd goes wild — one can easily see Vince McMahon thinking he could pull off such a ruse. Jim Hellwig, the man who would go on to become the (first?) Ultimate Warrior, started off as a bodybuilder — he won the title of Mr. Georgia in 1984 and placed fifth in the 1985 Junior USA competition — but he abandoned that calling while a member of a group of bodybuilders that jumped into pro wrestling as a stable called Powerteam USA. Soon, Hellwig defected along with another Powerteam member named Steve Borden (who would go on to a long, successful career under the name Sting) to form a tag team in Jerry Jarett's Continental Wrestling Association. They debuted as the Freedom Fighters and were slated to be good guys, but in the Jerry Lawler/Bill Dundee days of the CWA, the crowd was accustomed to cheering for pudgy tough guys, and Hellwig and Borden's chiseled physiques (and limited movesets) soon were drawing boos. They renamed themselves the Blade Runners, a point-for-point knockoff of the Road Warriors (right down to the facepaint and the movie-title team name), and they soon took that act to Mid-South wrestling (which became the GWF), where they found some success. Eventually, though, Hellwig struck out on his own and left for the USWA. He dubbed himself the Dingo Warrior and modified his facepaint to a tribal, full-face style that would stay with Hellwig throughout his career. He briefly tagged with Lance Von Erich (who was himself, in some respects, a fake Von Erich brought in to replace a dead one) and competed individually for the Texas Heavyweight Championship. What is most significant about this period is that he began fully fleshing out the character that would soon be known as the Ultimate Warrior — and the further into the character he descended, the further "Jim Hellwig" faded into the background. Here again, though, the Warrior's tenure was brief. He left WCCW in 1987 for the greener pastures of the WWF. Almost immediately upon his arrival, the Warrior — the Ultimate Warrior now — became a sensation. His in-ring shortcomings were effectively hidden behind a newly frenetic style and mostly short, decisive matches. He was not so much a man as he was a force of nature, and he was no longer billed as being from Queens, New York (as was the Dingo Warrior) — he was now from "parts unknown." He feuded with Mr. Perfect, "Ravishing" Rick Rude, and of course the Honky Tonk Man, from whom he won his first Intercontinental championship. Along this period, the Warrior began to hone his signature interview style — low on coherence and heavy on growling mysticism, it was a sort of carefully cultivated inanity. And as the years wore on, the Warrior's promos became idiosyncratically obsessed with death and preoccupied with theories of the afterlife — often touching on issues of masochism, destiny, and messianic visions. (He described the feeling of seeing a fan in facepaint like his thusly: "I know that that warrior is ready to make that sacrifice so that I shall live.") He was unique — incredibly strange and off-key for his era. Before long, the ecstatic crowd response made it inevitable that the Warrior would rise to the top of the ranks in the WWF, and indeed, he was chosen to be the heir to Hulk Hogan and his successor as world heavyweight champion. The two megastars squared off at WrestleMania VI with both title belts on the line. (The Warrior gave an interview before the match in which he talked darkly about going into the cockpit of Hogan's plane, taking the controls, and crashing it.) The Ultimate Warrior emerged victorious — earning a handshake from the fallen Hogan after the match, and the proverbial torch had been passed. As Hogan stepped back from the limelight, it seemed that the Warrior Era had begun. But his reign didn't prove to be as durable as his predecessor's — despite the hype and despite the Warrior's professed "destiny," it's almost laughable in comparison. As an insurgent, the Ultimate Warrior was irrepressible, but as a champion he was dull. The eccentricity that once made him stand out made him seem dark and bizarre in comparison to the shining light of Hulkamania. When Hogan rallied his little Hulkamaniacs to his cause, it seemed a joyous army; when the Warrior spoke to his "little warriors," he seemed to be preaching to a cult. If Hogan was the wrestling Billy Graham (the evangelist, that is, not the actual wrestler), the Warrior was Jim Jones. He lost the belt less than a year later to Sgt. Slaughter, who at that point was a nefarious, over-the-hill Iraqi-sympathizer (during the first Gulf War). Hogan returned to feud with Slaughter and retake his position atop the WWF, while the Warrior was relegated to a fatalistic feud with the Undertaker in which the Undertaker shut the Warrior inside a coffin, suffocating him. (He was revived, thankfully, by EMTs.) A corollary storyline with Jake "the Snake" Roberts saw the Warrior buried alive and (separately) bitten by a king cobra. At SummerSlam 1991, the Warrior revisited his feud with Sgt. Slaughter (and his Ba'ath Party compatriots, Colonel Mustafa and General Adnan), as he teamed with Hogan to dispatch the baddies. And then the Ultimate Warrior disappeared. It was said later to be the result of a contractual dispute, that the Warrior felt he was owed money by Vince McMahon and that Vince disagreed and fired him. But whatever the case, the Warrior made his (shocking) return at WrestleMania VIII, again to help Hogan, as he was being brutalized by Sid Justice and Papa Shango. And so the Ultimate Warrior was back, picking up where he left off. Or was he? If this new man wasn't the old Ultimate Warrior, then who was he? Kerry Von Erich? Jim Powers? Some unknown 6-foot-2 muscleman? After all, the WWF has pulled similar switches over the years. The Killer Bees' whole gimmick was based on their masquerading as one another; there was the Dave/Earl Hebner switcharoo at WrestleMania III; the Undertaker (Mark Calloway) was replaced for a stretch by Brian Lee (known lovingly to fans as "the Underfaker"); Jim Ross brought imposter versions of Diesel and Razor Ramon to RAW after Kevin Nash and Scott Hall, the men who originally played the roles, defected to WCW in 1996. Which is all to say that even if rumors of the Warrior's actual death were unfounded, the idea of replacing him wasn't at all unlikely. And for anyone looking for clues, the Ultimate Warrior's career sent off many more signal flares than did all of the Beatles' album art and reversed tracks after Paul McCartney "died." There were the thanatophilic promos, the morbid feud with the Undertaker, and now, upon his return, a new grudge against voodoo doctor Papa Shango, another mystical overseer of the hereafter. Shango cast a spell on the Ultimate Warrior that left him vomiting multicolored bile and "possessed" him, at one point causing a blood-like ooze to trickle down from his scalp during an interview. The Beatles might have been bigger than the WWF (and Jesus), but the amateur detectives that set about parsing the Warrior's "death," however, were no less ardent in their pursuit. Although much of this theorizing occurred prior to the heyday of internet message boards, there are glimpses across the web of various Hellwig death theories: that he died of liver failure due to years of steroid abuse, or that his tasseled arm bands cut off his blood circulation. That such "establishment" websites as obsessedwithwrestling.com and warriorcentral.net loudly deny the rumor — that they have to entertain the question at all — only reaffirms the conspiracy theorist's mindset. Whoever it was underneath the paint, the Ultimate Warrior's career was intermittent at best from that point on. Around this time he legally changed his name to "Warrior." It has been sold as a defiant act of copyright protection, and that may well be true. But one wonders if it didn't also conveniently put "Jim Hellwig" — and any lingering questions about the identity of the man behind the character — to rest. In 1995, in an odd turn of events, WWF rival WCW, then the home of Hogan, introduced a "new" character called the Renegade — a fighter (real name: Rick Williams) whose entire gimmick, although it was never stated as such on air, was that he impersonated the Warrior. The audience was at once energized and perplexed. And for those convinced that the Warrior had been replaced all those years before, this was proof that it could be done. It may have been a case of WCW trying to cash in on the persistent popularity of the Warrior without having to pay the actual man. But pro wrestling is a strange, incestuous world where many new character names and countless storylines are veiled references to off-screen stories. Many fans are aware of these traditions — it's part of the game, and the WWF (and other federations) have conditioned its viewers to be conscious of this sort of signifier. The story of the Ultimate Warrior, whether or not you take his death as fact, is one of these metatextual games — it's basically Nabokov with muscles and facepaint. And at the time, there were certainly whispers that with the Renegade, WCW was trying to make a comment about the Warrior's authenticity. The "real" Ultimate Warrior returned (again) to the WWF in 1996, but this stint was even briefer than before — only about four months. After another money-related dispute, the Warrior said his final farewell to the WWF. He turned up in WCW in 1998 for a poorly planned feud with his old nemesis Hogan. In one terrible sequence, Hogan looked into a backstage mirror and saw the Ultimate Warrior looking back at him. This is supposedly a storyline idea that the Warrior came up with himself. It was intended to symbolize the Warrior's having gotten into Hogan's head, but one wonders whether a more profound message was being conveyed, whether the Warrior himself was trying to broach the subject of his own existence. Whether or not this was the original Warrior, though, it was certain that the "old" Warrior's magic had fully disappeared. He certainly emerged from wrestling a different man — the animalistic bodybuilding egotist of yore is today a clean-cut, buttoned-down conservative talking head. Only his fascination with death seems to have remained constant. In various online outpourings, the Warrior made light of Michael Jackson's death — "Well, you gotta give him credit for one thing. He spent all his money (and then some) before he died." 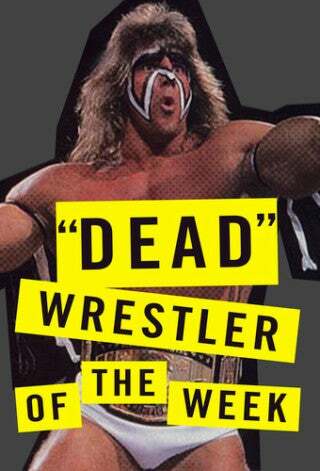 — said that Heath Ledger was "better off dead," and advised Hulk Hogan that he should do himself in as well. When asked about the wrestlers who have died in recent years, the Warrior was brusque: "I'm not like some of the idiots I used to work with. ... I don't have any sympathy for them." On his blog, he makes dismissive but telling remarks about Martin Luther King Jr. and Jesus — both spiritual leaders who were killed before their time. The universe of professional wrestling is rarely constrained by reality, and rumor and innuendo of backstage goings-on run wild. But never has a mystery of this magnitude taken root in the sport. In his heyday, the Ultimate Warrior vociferously defined himself as more than a lone man. He was a symbol for a creed, a lifestyle — and, at times, it certainly sounded like he was talking about some sort of suicide pact or death cult. Little wonder that questions about the Warrior's transience became so prevalent. That fans to this day are uncertain about the Warrior's survival speaks to both the gravity of the supposition and to the tenacity of the conspiracy theorist's mindset. It should be said, I suppose, that these rumors are almost certainly false. Like McCartney, Spuds MacKenzie, and, of course, Mark Twain, reports of the Warrior's death have been greatly exaggerated. The conservative crank and sometimes steroid denialist of today is the same Jim Hellwig who quivered and growled in the ring throughout the '80s and '90s. There's really no evidence to the contrary. But, hey, it makes a good story. That's what pro wrestling is about. And what of Renegade, the Warrior's WCW doppelgänger? Rick Williams was released by WCW in 1998. His fate was all too real: Deep in a battle with depression, he committed suicide in February 1999.